My overnight stopover in Kuala Lumpur was fairly short. I was arriving before 8PM, and departing the following morning at 9:40AM to Tokyo. Kuala Lumpur has a lot of great luxury hotels that are reasonably priced (for example, I love the St. Regis), and some are easily accessible by the KLIA Express. However, I knew I wanted to get back to the airport really early to be able to review the lounges, so I decided to try something different. KLIA has one airside transit hotel, which is Sama-Sama Express. Being able to stay within the secure area seemed really convenient, so I booked that. I booked a room for a 10 hour block, from 8PM until 6AM, at the cost of ~112USD. That’s not much cheaper than some good hotels in Kuala Lumpur, though obviously you’re paying for the convenience. I had to walk around to the other side, in the direction of gates C1, C3, and C5. That’s where there was signage for the hotel. Sure enough, the entrance was just a short walk away on the left. All of the facilities are on the second floor, so on the first floor there’s just a staircase and elevator. Upon exiting the elevator, the reception desk was straight ahead. The check-in process was straightforward, and within a minute I was given a key to my room. Sama-Same Express also has an airport lounge, which is contracted out to certain airlines. When I arrived this place was crowded. I was assigned room 126, just down the hall from reception and on the right. The room was quite large. Inside the entryway the bathroom was to the right and the rest of the room was straight ahead. The room had a king size bed, a chair by the window, and a TV and desk across from it. 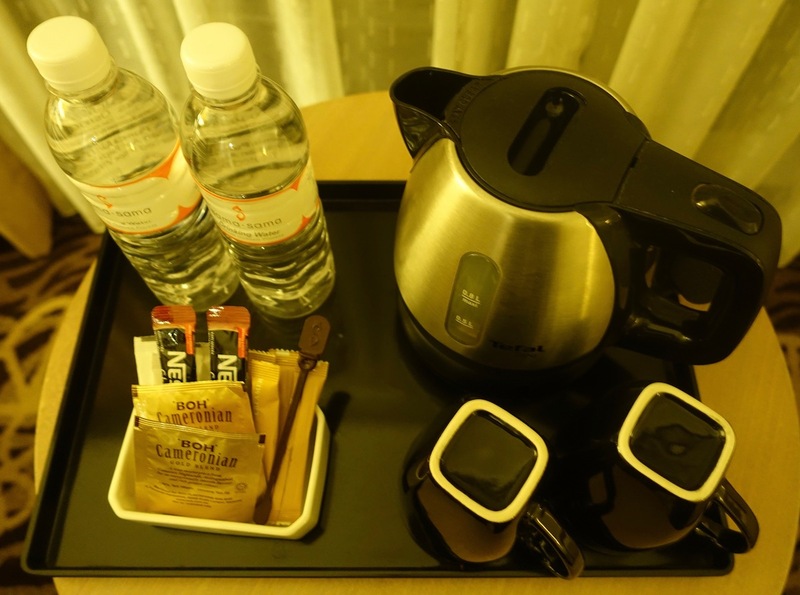 There was a kettle with instant coffee and tea, as well as two bottles of water. The room did have a cool view of the apron, and in particular of an ANA 787 parked just outside my room. The bathroom was back towards the entrance, with the sink being in the main part of the room. Across from it was a safe. 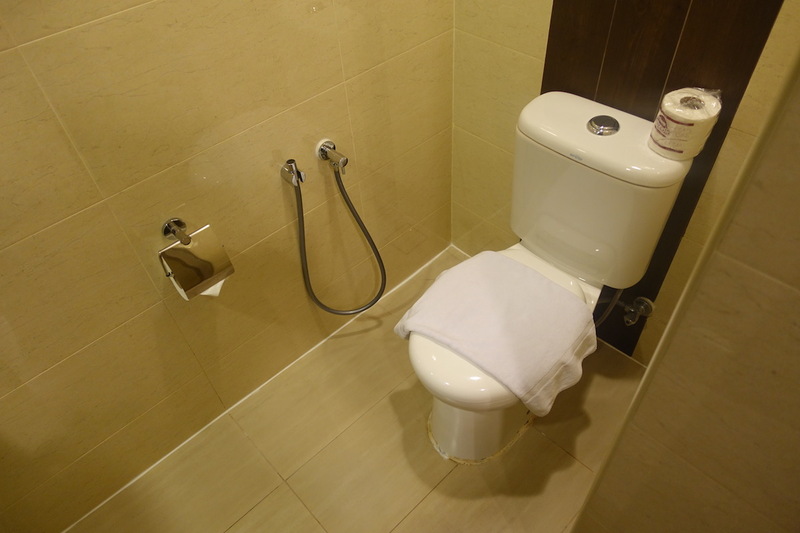 Then the toilet and shower were in another room, with no real separation between them. Toiletries were in wall-mounted containers. From a distance the room looked nice enough, but I just didn’t feel like it was very clean. The carpet was quite stained, the sheets had tons of stains (not like they weren’t washed, just like they had been used often), the bathroom floor was really sticky (like they used cleaning materials but then didn’t mop with water or dry afterwards), and the room had an odd odor. It wasn’t terrible, but it just didn’t feel very clean to me. The hotel did have wifi, which was fast and free. I ended up sleeping for several hours, but woke up at 3AM. At that point I figured I might as well get up and just head to the Malaysia Airlines lounge and work, given that it’s open 24/7. If you’re looking for a real bed during a long connection in Kuala Lumpur, Sama-Sama Express is your only option. The hotel is conveniently located, and the rooms are large. Personally I felt like the room wasn’t especially clean, so I don’t think I’d return, as I’d much rather just head into the city and pay a little more for a five star hotel. But it’s a good option to have nonetheless.